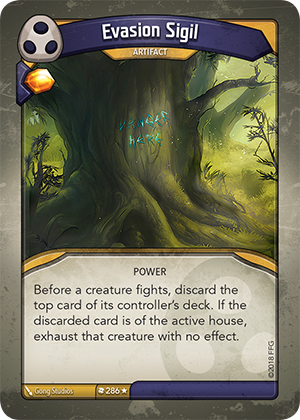 Card Text Before a creature fights, discard the top card of its controller's deck. If the discarded card is of the active house, exhaust that creature with no effect. What happens if Evasion Sigil is in play, a player selects a creature to fight, and that player’s deck is empty? You can only shuffle your discard pile to reset your deck when you need to draw a card, not when you discard a card. Therefore, if a deck is empty, a card cannot be discarded and Evasion Sigil has no further effect (i.e. the attack proceeds as normal).